Unless you’ve visited the “about page” on le sauce within the past few months, you might have missed that I’m working on a couple of food shows. Being the Interactive Producer, you’d think it would just be me and my computer screen, but the teams are actually, well, teams. The shows’ producers couldn’t be more generous and encouraging, so we’re all welcome on set and even in the control rooms. I’ve learned a ton, but the best part is stuff like this… having to shoot step-shots for the site, sometimes results in ghost sitings! On mornings like that, it’s especially hard to call what I do all day (obsess about food) work. Hope you see your share of ghosts this weekend–as long as they are as cute as this. Happy Halloween. Ohhhh, these are so cute! 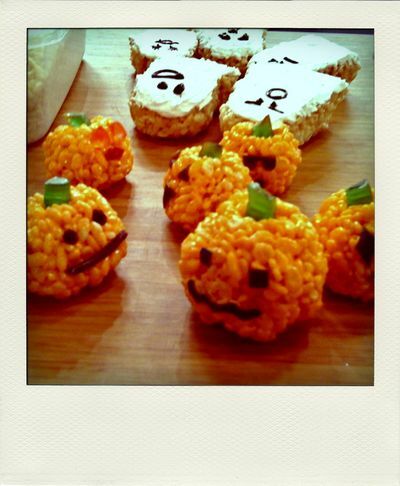 Marshmallow rice treats? I should do this next year.